Enhancements include a PON option allowing accurate event analysis after a 1x32 splitter with significantly reduced undershoot effects. Also unique to the industry is a built-in section of launch fiber to eliminate the need for a separate launch box. 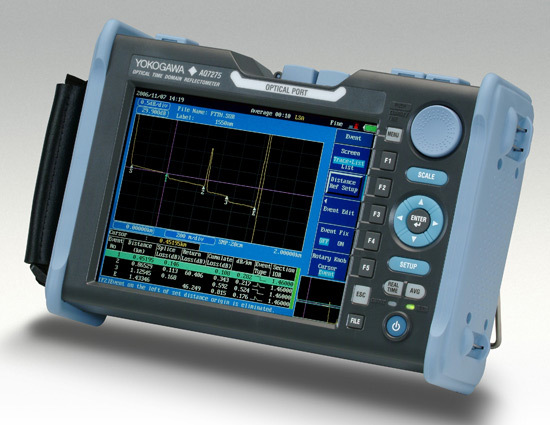 Latest standard features includes the convenient capability to display a fiber connector inspection probe using one of the unit's standard USB I/O ports. 3 1310/1550/1650nm 40/38/30dB 735037 3-wavelength model, supporting a maintenance wavelength of 1650nm including 1310/1550nm cut filter. 40/38 dB(SM) 735041-New 4-wavelength model for installation and maintenance of LAN and FTTH with support for both multimode and single mode fiber. Dynamic range is specified when measuring 50GI fiber. 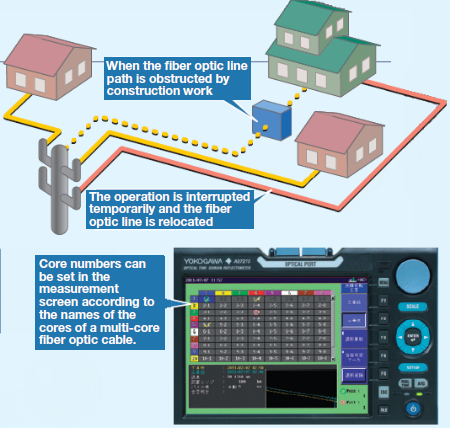 Meets a broad range of measurement needs from FTTH to Metro, Core network. 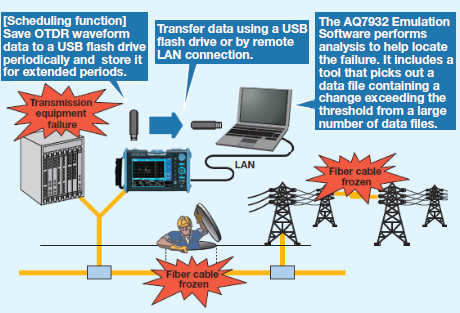 Accompanying the rapid proliferation of FTTH is a growing need for detection of reflective events arising from short distance mechanical connections. The AQ7275’s short event dead zone enables detection of closely spaced events in cables installed in offices and customer premises. The new High Dynamic range model (735034) can achieve the dynamic range of 40 dB. This high dynamic range is effective in measuring a transmission line consisting of long fiber cables and a splitter with a large loss. * The stabilized light source option cannot be used for the 735041 (MMF). This option can be used for identifying the multicore fiber cable and visually checking for a failure. The adopting the connector connection method enables the visible light to reach greater distances with less light leakage. * The visible light source option cannot be used for the 735036, 735037, and 735041. 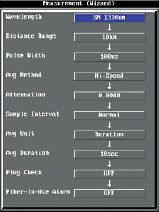 You can use the dummy fiber to effectively detect abnormal near-end connection loss. * The dummy fiber option cannot be used for the 735041. * The built-in dummy fiber is not attachable and removable. 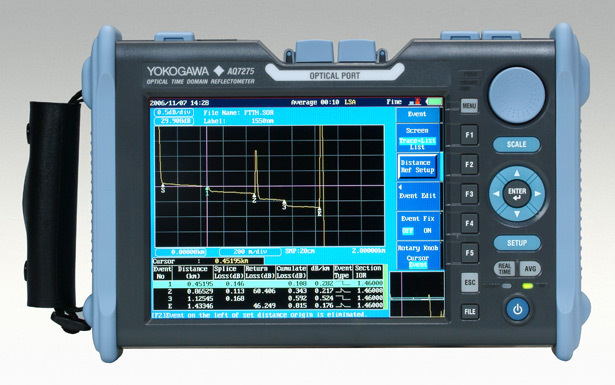 This is useful for simply checking optical power when performing link loss testing or troubleshooting. * The optical power monitor option cannot be used for the 735031 and 735041 (MMF). You can connect an optical fiber with an angled-PC connector directly to the OTDR. The angled PC is often used for CATV networks to reduce the influence of reflection. External battery attached to the the OTDR extends the battery operation time up to 18 hours, which is three times the standard battery operation. Measured results can be printed on site. It makes it easy to attach the printed sheet to your report. Remote control and FTP (file transfer) via LAN is also possible. Simply select the measured wavelength and the AQ7275 takes care of the rest by automatically setting the optimal measurement conditions and by performing measurement and event analysis, and fully automated data saving. Display the guidelines for the setup items from the Setup menu. Follow the step-bystep instructions to complete the setup. This mode allows you to set all the detailed settings, not only the measurement and analysis settings but also the screen display and system settings. One-button MeasurementSimply select previously set measurement procedures and then push a button. You can execute up to 5 previously set and saved measurement procedures automatically. Measurement and analysis conditions can be loaded from a file, making it easy to set up measurement procedures you executed previously. Just push one button to switch multiple wavelengths and perform measurement automatically. Measured waveforms for multiple wavelengths are displayed on a single screen, so it is easy to compare the waveforms. The measured data is saved to memory. The plug check function monitors the condition of the optical connectors and displays an alarm if the connection is not properly made. This function is useful for checking for damage, dirt, or other problems with optical plugs at the OTDR or on the fiber under test. It is also useful for helping technicians to remember to connect the fiber under test. The fault event display function detects and displays abnormal connection or reflection points. Of the events detected by this function, abnormal events that cross a specified threshold value are highlighted in the event table and waveform display. 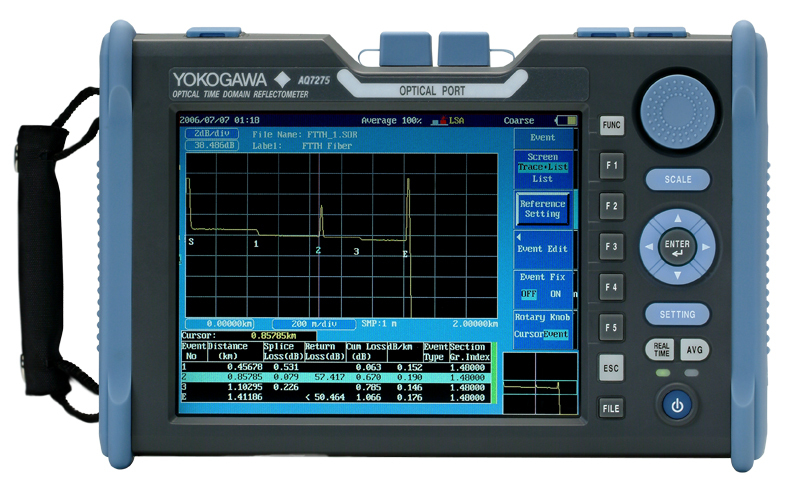 This function enables you to freeze the display of one waveform and overlap it on real-time or averaged waveforms. This is useful for creating a template when installing multicore fiber, or for checking aged deterioration during maintenance on existing fiber networks. 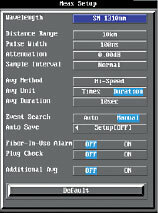 In addition to the last measured waveform, a waveform can be loaded from a file for use as a reference waveform. The AQ7275 has two USB 1.1 compliant connector ports as standard (Type A and Type B). Type A port is for USB memory and USB hard disk drivefor storage. Type B port is for connecting external PC. AQ7275 can be remotely controlled from external PC, and an internal memory of AQ7275 can be accessed from external PC directly. The Multi fiber measurement function automatically performs measurements and data-filing according to a pre-established file name table. At worksite, you can execute it by simply selecting a fiber number in the table. The saved waveform can be easily shown in the preview window by selecting the core number in the table. The OTDR Project File Editor included in AQ7932 Emulation Software greatly saves time to create file name table. Communication services must be interrupted when existing fiber optic cables are rerouted due to construction work of roads and buildings. This function minimizes the duration of the interruption by improving the efficiency of the rerouting work. 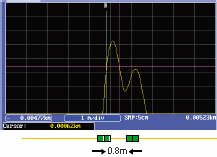 A waveform is measured before and after the work and compared against one another to determine a pass/fail condition using a user defined threshold criteria. This function also enables the management of cores of a multicore fiber optic cable by number and color. This prevents the user from measuring a wrong core. Numbers for measured cores are marked with check marks. This prevents the same core from being measured multiple times plus ensures no cores are overlooked. If there is a bend in the optical fiber, the longwavelength loss is higher at the location of the bend. failures are restored automatically after several minutes to several hours. Thus the failure cannot be located due to the temporary nature of the fault. used to call up the data before and after the fault event from a large amount of data automatically saved to the USB flash drive, and analyze the chronological changes in the waveform to locate the failure. that detects a data file containing a change exceeding the threshold from a large number of data files; and a tool that batch calculates losses between two points.